Sometimes you come back from somewhere and the awesomeness just overwhelms you doesn’t it? Well, if truth be told, I feel a bit shell-shocked after the utterly amazing night away The Boy Wonder and I have just had courtesy of Heather and her amazing team (especially the gorgeous Magda). We got an early finish from work meaning we left the nest at 3pm and we were sighing a breath of relaxed bliss in the Yew Lodge Hotel reception at 3.30pm, not a bad journey at all in any ones book. It was lovely that Heather and Magda took time out of their hectic schedules to sit with us in the plush lounge for a coffee and a chat, and made more so by the plethora of photographs of my long-time crush, Marco Pierre White that adorned the walls. I kept swooning secretly every time I looked at one. The Chocolate Brownie squares that came with the coffee were mind-blowingly good; velvety textured, gooey, rich, in short just the perfect Brownie. 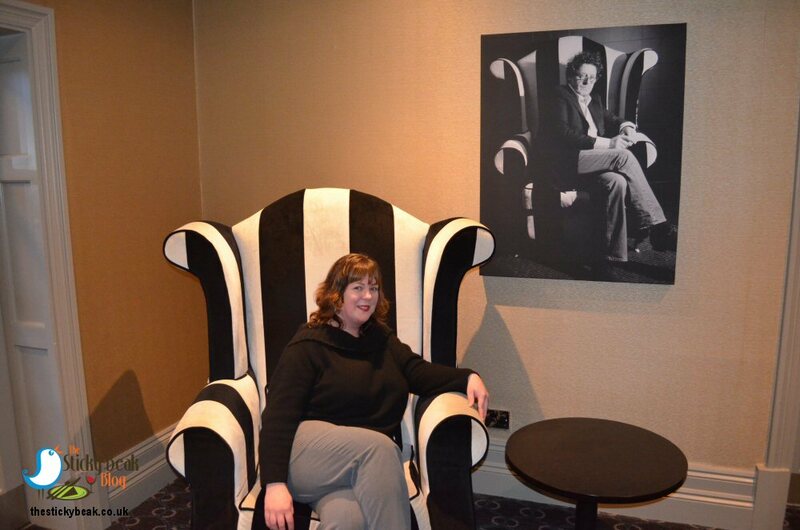 All too soon the ladies had to go and finish their tasks for the day and the Man and I drank in the laid back ambience of the lounge and I had my photo taken next to Marco (well, his picture) whilst reclining in his McQueen designed, uber-stylish monochrome chair. 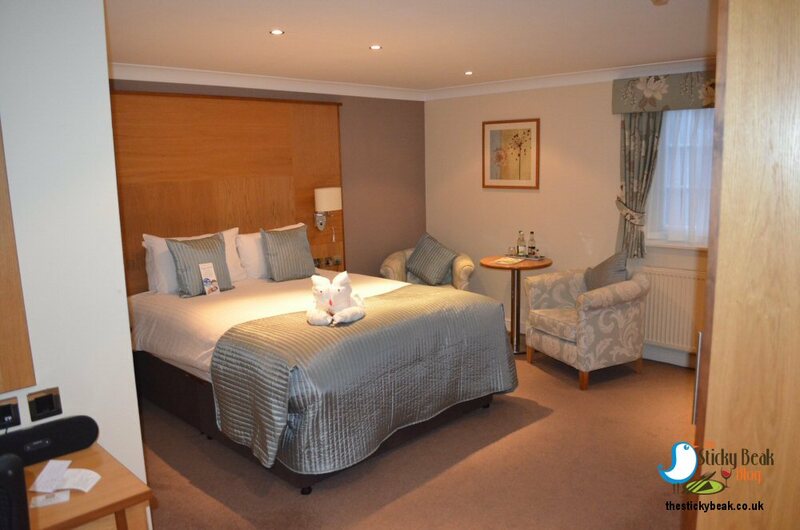 Our room was really spacious and beautifully styled in subtle hues of cream, duck egg blue with hints of gold. The chambermaid had laid a rabbit made from towels on our bed and he was clutching more of the sumptuous Brownie in his paws. We unpacked our bags and placed our clothes in the wardrobes and arranged other bits and bobs on the tables and chairs and I went to take a peek in the Bathroom. My little squeal of delight had the Man joining me to see what my excitement was about; not only was there a lovely Jacuzzi bath with shower over it, there were Elemis toiletries to use. I think little quality touches really do make a difference, don’t you agree? Left to his own devices I think His Nibs would’ve been happy channel surfing on the fantastically sized television, but I had got other plans for him. Within a couple of minutes we were both in our swimwear covered by soft white bathrobes, wearing matching slip-on slippers and wending our merry way down to Reeds Health Club and Spa. Well, it would’ve been rude not to thoroughly check out all the fantastic-ness at Yew Lodge, we thought. The reception is always manned, and the staff were lovely and friendly as they handed us our complimentary towels and gave us directions to the changing rooms. What a lovely Spa it is as well, the term “small but mighty” definitely applies here; there is swimming pool with Jacuzzi at one end, a Steam room, Sauna room, foot baths to sit at, a Polar Bear that issues ice chips from its jaws and a great little raised area with loungers on that you can sit and read, or recline, on. If you gaze upwards you can see some of the nicely appointed gym, and there were several club members using the facilities. 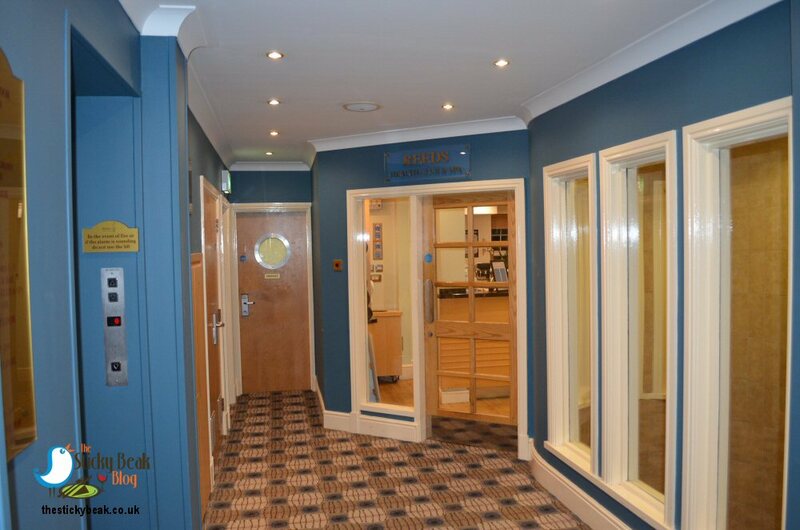 There is also a treatment suite where Elemis treatments are offered, but these must be pre-booked. Yew Lodge do a range of Spa packages, whether it be for a Mum-and-Daughter retreat, a Hen Party or Birthday celebration. Before we knew it, nearly two hours had flown by and we needed to go back to our room to freshen up ready for our evening meal at 7.30pm. 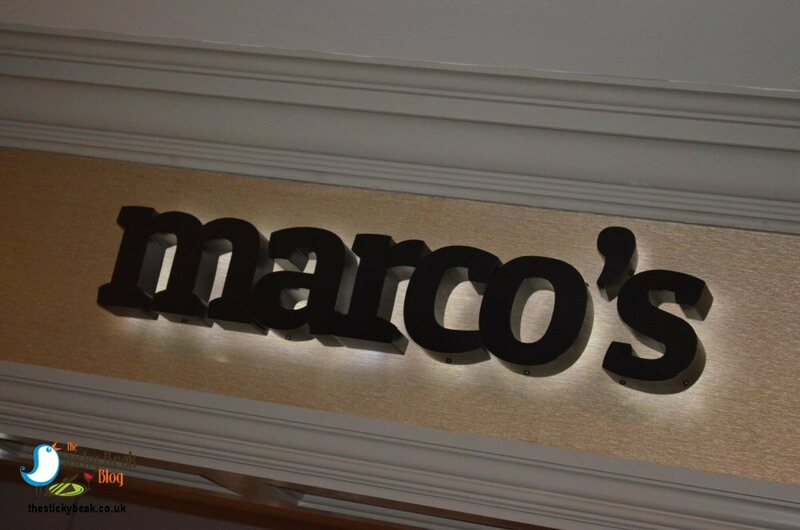 We had an incredible evening in Marco’s and you can read how we got on here. After dinner we wandered back to our room, made ourselves a Cadburys Hot Chocolate (me) and a Nescafe Cappuccino (The Man) and settled in to watch a bit of Telly before dropping off to sleep in the lovely soft cloud that was our bed. We woke up bright eyed and bushy feathered in the morning and walked down to the restaurant for our breakfast, which is served from 7am until 10am. 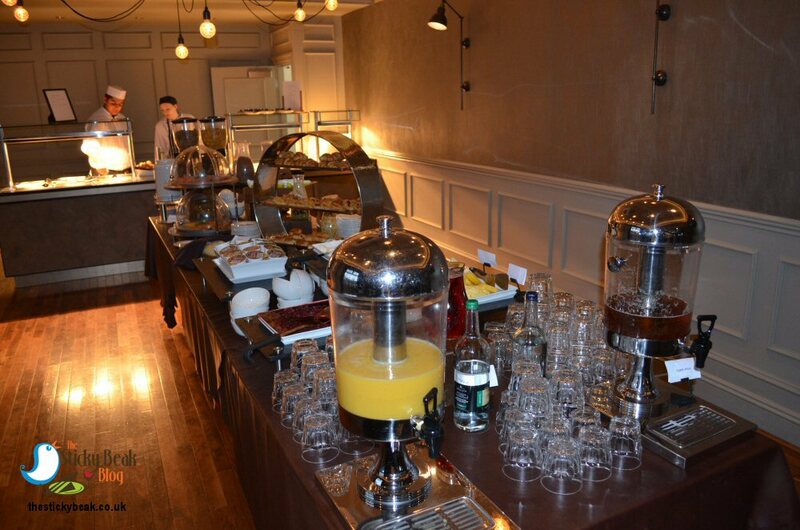 As well as the hot counter for the ubiquitous Full English Fry up there was a plethora of Pastries and breads to choose from and Cereals of every kind imaginable. I started off with a bowl of Natural, thick, creamy yoghurt and topped it with red berry compote, fresh apricot halves and fresh pineapple slices and His Nibs had a couple of croissants and a pain au chocolate. We helped ourselves to a glass of Orange juice, but there was also Apple juice and Cranberry juice available as well as bottled water. A lovely server came and asked if we would like tea or coffee, and soon brought us a big pot of tea out for us to share. When we had finished our first part of breakfast it was up to the hot counter to help ourselves to the more traditional breakfast items. 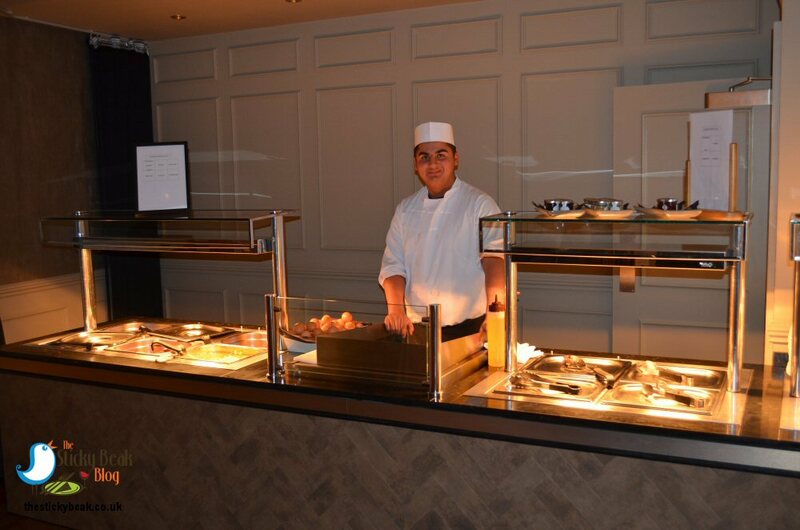 I liked the fact that although the softly scrambled egg was in a tray, if you wanted poached, soft boiled or fried eggs then the chef did those fresh to order for you. 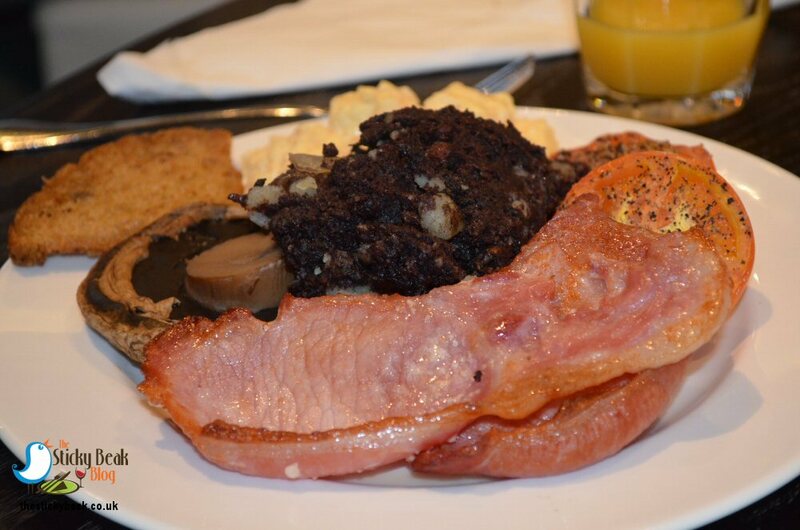 We came back with plates laden full of mouth watering food; I had scrambled egg, back bacon, black pudding and onion hash, whole field mushrooms, seasoned grilled tomato halves and fried bread. The Man came back with bacon, fried egg, hash browns, beans and sausages (from Owen Taylors). Every single item was piping hot, and nothing had overcooked, even those items on the hot plate, thanks to the attentiveness of the chef; he kept moving and turning the food to keep it evenly cooked and didn’t overstock the trays so that nothing had chance to go stale. The result was a superb breakfast that left us full to the brim, in fact we didn’t eat anything else that day until our dinner that night. The last job was for us to check out and this process was super smooth, thanks to the skilled reception staff. Thank you once again to Heather and Magda and their incredible team of visible, and those you don’t see, staff. You all gave us such a fantastic experience, one that won’t ever be forgotten.